On 25 Jan 2019, Transport Minister Khaw Boon Wan announced that 1st phase of cross-island line will open by 2029. 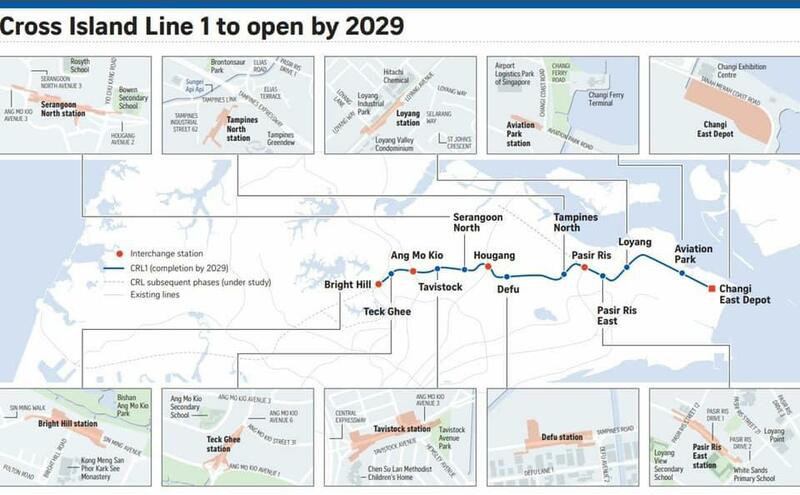 It will be 29km long,12 stations and pass through areas such as Changi, Loyang, Pasir Ris, Hougang and Ang Mo Kio. "When it is completed by 2029, more than 100,000 households will enjoy better connectivity and shorter travelling times," Mr Khaw said. For a residential property, one of the key determinant of the value is its distance to transportation nodes. Based on a study of properties near the Circle Line, it's discovered that the opening of a new MRT line increases the value of non-landed private homes located within 600 metres of the MRT stations by 6.3 per cent. It further showed that properties near interchange stations have an additional 4 per cent premium. The impact, however, may not be obvious when the announcement was made, will become more significant closer to the completion period. With the upcoming cross-island line, some private developments (refer to below table) within 600m are expected to see a price appreciation over time. The impact may vary depending on the its distance to key employment centres, leisure amenities, educational institutions, existing price levels and competition within the vicinity. Buyers who are looking for new launch project along the line, can consider Affinity at Serangoon. It was situated near Serangoon Garden estate, an area popular with well-heeled Singaporeans and expatriates, with its close proximity to amenities and top international schools. At the moment, most residents in the area rely on private transport or public buses due to the absence of MRT stations nearby. With the upcoming cross-island line, the connectivity will be boosted and its appeal to investors and renters will be increased.